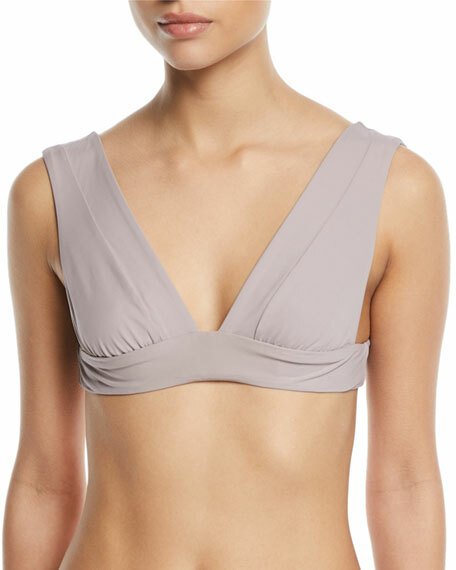 Vitamin A "Magnolia" swim top in solid microfiber. As Amahlia Stevens traveled around the world for inspiration to craft surf and swimwear for other designers, she repeatedly found herself wondering why there wasn't a figure-flattering bikini on the market. So, the Southern California native developed it herself, and Vitamin A swimwear was born. The Little Black Bikini is the cornerstone of the collection, boasting construction that slims hips, boosts the bust, and delivers an overall flattering look. Each subsequent Vitamin A piece promotes figure flattery, and calls back to the freeing SoCal life that Stevens so treasures. For in-store inquiries, use sku #2551438.